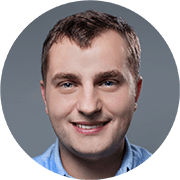 Kontakt.io’s note: This blog post is written by Bernhard Mehl from KISI, a New York-based customer that specializes in using beacons for security purposes. Bernhard combined current proximity trends and his observations, and created a list of 6 types of beacons that are about to show up shortly. Here’s what he came up with. At KISI, we use iBeacons in many different forms and for lots of functions. The range of possibilities is already huge, but it’s just the beginning of an exciting technology that has much potential to evolve and transform. 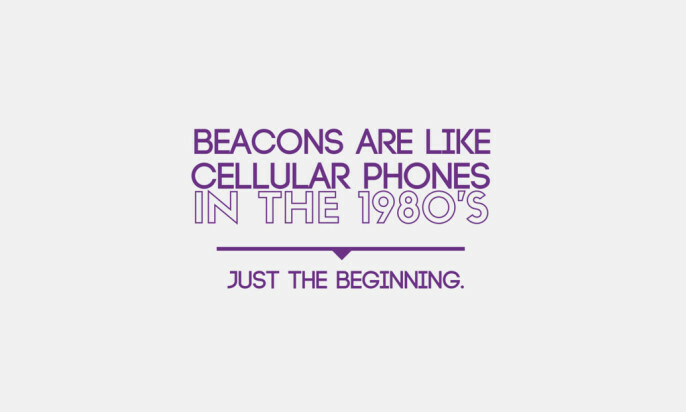 Today’s beacons are like cell phones in the 80s. When cellular phones first launched, they were clunky bricks only capable of calling a number. 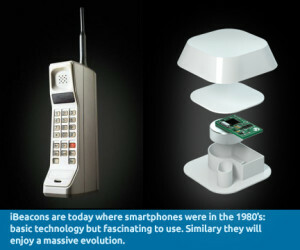 Eventually, that transformed into smart, personal micro computers. For beacons, such progress is more than sure—there will soon be many varieties of beacons cropping up. Adding to the already existing list of advanced beacons like cloud connected beacons (here’s Kontakt.io’s version) and outdoor Beacons (also Kontakt.io provides these already), we can imagine a range of Beacon types that we hope manufacturers like Kontakt.io could provide in the future: Power Beacons, Hybrid Beacons, Mesh Beacons, Secure Beacons, Intelligent Beacons and Wearable Beacons (my favorite one!). Power Beacons are beacons with larger range than regular ones, and as such are more energy-consuming. They will mostly be wired or be larger in size hence requiring big batteries. They could be used for general office occupancy or used to provide information in a zoo or park where dimensions are a little bigger than in for example in museums. Bluetooth isn’t appropriate for all use cases for proximity. Adding Near Field Communication or another proximity technology will give greater and fuller flexibility than in using just one technology. Use cases for such a beacon might be payment or check-in where cross-platform compatibility is a priority. Mesh beacons are interconnected beacons who could transmit data from one beacon to the next where it basically forms a long chain of communication without the need for wiring. It also allow a more accurate positioning of user devices. We might see indoor navigation systems or peer to peer messaging services in the office. Imagine Slack communicating on your own BLE network! Regular beacons just broadcast a UUID in unencrypted format. There is strong demand to create encrypted Beacons based on open source protocols to make iBeacons usable for identification and authentication purposes like subway passes or access control. Intelligent Beacons with an onboard processor could compute information on their own chip. This would allow interactions without internet connectivity. Basically, it could be a standalone system that could be used for displays of advertising like dynamic taxicab screens which change with the crowds passing by. Used as keychain tag, iPhone casing or weaved in your clothing, wearable beacons could enable natural user interfaces in the style of Minority Report: Weave your hand in a direction while biking and the beacon wristband updates your navigation system. Attached to sports clothing you could do an in-depth analytics of your movements. Or imagine air-drumming without sticks. This could be wild. Over time, beacons will become smarter, without a doubt. Looking at ourselves: Once we have started wearing a smart device, we became a dynamic datapoint on the map. The exact same trend could happen to our built environment essentially being equipped with smart beacons. This would create a smart sensor network which allows us to interact with the environment in whole new ways. Thus, the future of iBeacon applications might be combining the data points we and our environment generate creating an interaction layer on top of reality. 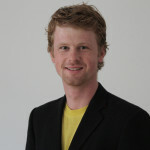 Bernhard is an industrial designer at heart. He is also the co-founder and CEO of Kisi, Inc., a modern security system for offices, co-working spaces, and multi-family housing projects. KISI is the first security system people will love. Features include keyless entry via smartphones, centralized management of worldwide facilities and seamless scalability. Never lose control over a keycard or key again! 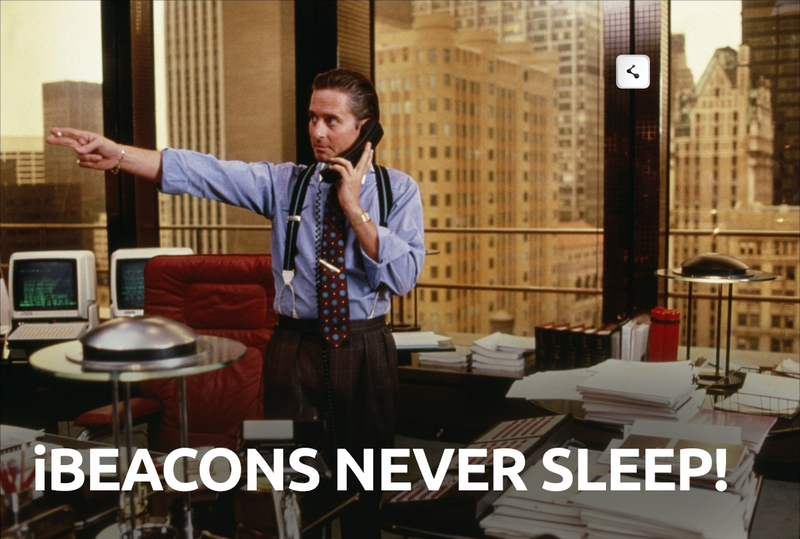 It’s true that beacon technology is still just starting and the development speed is immense. Our beacons can already communicate with the cloud for remote management and data reporting. This includes power management, scheduling configuration values, and venues management. Sure, there’s still room for improvement but given that we’ve already achieved so much, further enhancements such as the ones that Bernhard mentioned are just a matter of time. What could I add to this list? An Everything Beacon. One day beacons will be everywhere, but we won’t be able to see them — beacons built into things (such as the JIVR Bike that we’re working with) will replace plastic devices mounted on things, all managed securely and easily from one cloud platform. That’s the Internet of Things we’re aiming for. And the day will come soon. How Big Is the Beacon / iBeacon Market and Internet of Things Going to Get?